If you plan to apply for government benefits or a passport, or register your child for school, you will probably need a birth certificate. If your original birth certificate was lost or destroyed and you were born in Grand Rapids, Michigan or Kent County, you can obtain a certified copy from the clerk's office. You may also order your birth certificate online; birth certificates for adoptions and births that occurred before 1978 to single parents must be ordered from the State of Michigan. Ensure that you have the authority to order a birth certificate. You must be the individual named on the birth certificate, a parent or a legal guardian. 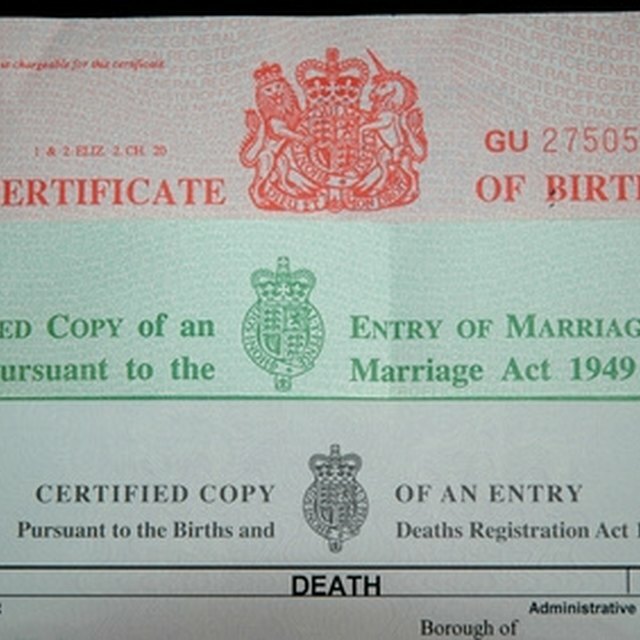 Heirs of a deceased individual must provide a death certificate for individuals under 100 years old. Birth certificates over 100 years old can be acquired by anyone. Visit the Kent County Clerk's office in Grand Rapids between the hours of 8 a.m. and 5 p.m. You will need to complete a birth certificate request and provide photo identification. Pay the fees in cash, check or money order to receive the birth certificate. As of 2010, the cost of a birth certificate is $10 for the first copy and $3 for each additional copy. If you are 65 or older, the cost of a birth certificate is $7 for the first copy and $3 for each additional copy. Print and complete the "Birth Certificate Request Form" from the Kent County Clerk's website. Make a photocopy of your photo identification card. Address an envelope with the address you want the birth certificate mailed. Access the Kent County Clerk's website. Select "Order a Birth Certificate." Verify that you are eligible to order a birth certificate online. To order online, you must be a party listed on the birth certificate. Complete the online request. Pay the fees with a debit or credit card. As of 2010, there was an additional $3 convenience fee for online orders. The name on the credit card must match the name of the person making the request. Allow three to four days for processing and shipping.